ATLAS ACS 2-TIMI 51: Mega JL, et al. Rivaroxaban in patients with a recent acute coronary syndrome. NEJM 2012;366:9-19. Over ~13 months of follow-up, the addition of rivaroxaban 2.5 mg BID to ASA+clopidogrel/ticlopidine reduced the risk of CV events, mainly driven by fatal events, which led to lower all-cause mortality (NNT 63) in patients post-ACS. Adding rivaroxaban also reduced stent thrombosis (NNT 143). This came at the cost of a greater risk of major bleeds (NNH 84), including intracranial hemorrhages (NNH 500). Adding rivaroxaban 5 mg BID did not reduce mortality, & further increased the risk of major bleeds. It remains unclear which of the following regimens would have the best balance between efficacy & safety: Ticagrelor-based DAPT, clopidogrel-based DAPT + low-dose rivaroxaban, or ticagrelor-based DAPT + low-dose rivaroxaban. 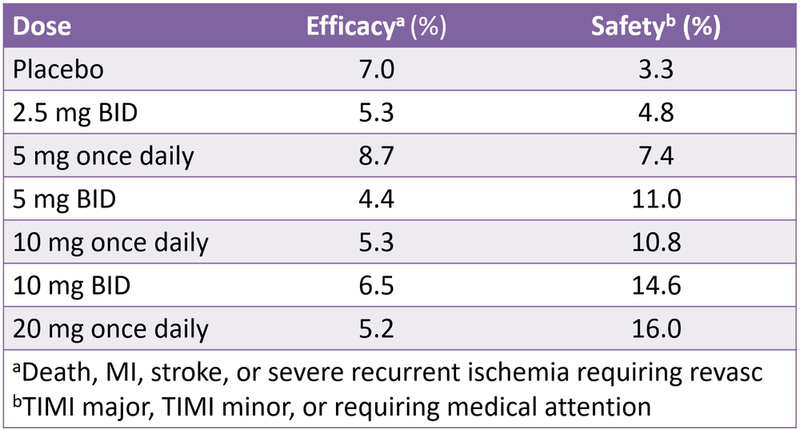 Based on the preliminary results from ATLAS ACS-TIMI 46 (see below), the investigators selected 2.5 and 5 mg BID doses of rivaroxaban for this trial; this is pharmacokinetically rational given the 5-13h half-life of rivaroxaban (apixaban & dabigatran have similar half-lives and are generally dosed BID), however, it is a very different regimen than that used for AF/VTE. As a result, it's unclear if this regimen preserves the efficacy of rivaroxaban for these other conditions.